A screenwriter, novelist, and playwright, Jerry was gracious about sharing his stories, reflections, and memories. His warmth and kindness were immediately evident. This interview with Arthur Hicks was conducted over a decade ago, but it feels more inspiring, relevant, and necessary than ever. Dr. Hicks grew up in the segregated South, served his country as a Tuskegee Airman during World War II, and went on to become an educator and a human rights activist. In 2001, Stephen Chiapella visited the students at Dunn Middle School, and shared the colorful story of his family’s adventures in Mexico and the United States. It's a classic California saga about ethnic diversity and the need to accept and embrace change, told with his characteristic humor and modesty. He passed away in 2014 at the age of eighty-eight. For Emmanuel Nana Akyen, soccer has been a pathway to a wider world. Born in Ghana, and by the age of five an orphan, he was recruited for the Right to Dream Academy, where he honed his athletic and academic talents. This led to an opportunity to attend Dunn School in California, and eventually a scholarship to Westmont College, from which he graduated in 2014. He is now coaching soccer and developing a bigger plan for helping to change the lives of others. Nana's warmth, intelligence, and humor are evident in this interview. Read on, and meet a truly inspiring young man. Chairman and Chief Executive Officer of Rancho Mission Viejo, Tony Moiso is one of Orange County's most influential citizens, a man with a proud California heritage. This interview was arranged by Tony's 25-year-old nephew, Richard Avery. It became a very special intergenerational conversation between two family members. We met Tony at the Rancho Mission Viejo Headquarters on June 15, 2017. 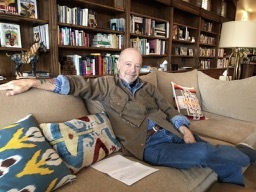 I interviewed Aris Alexander at his Hollister Ranch home in Gaviota, California on November 15, 2016. A retired professor of psychiatry, Aris is erudite and thoughtful. He spoke candidly about life, priorities, and happenstance. Sean Herzig has lived and worked at the Hollister Ranch for more than twenty years. Kind, perceptive, and capable, he’s one of those people you just feel glad to see, someone humble and decent, quietly contributing. Here he shares some thoughts about the importance of family, work, and community. Hollister Ranch cowgirls Kathi Carlson and Sue Benech Field share their stories with humor and heart. Researcher, writer, and historian Myra Huyck Manfrina is a vital force at the Lompoc Historical Society, still sharp and active at the age of ninety-five. We had a delightful conversation about the past and present. Born in Oklahoma in 1929, long-time Lompoc resident Jessie Fabing Koenig shares her thoughts here on loss and change, the pleasures of gardening, poetry, and tea, and raising ten children on her own. In this 2003 interview, Ray Valdez talked about the hard life he knew as a migrant worker and the kind of poverty and struggle that might have defeated a lesser spirit. While his grandkids were students at Dunn, he helped out with everything from camping trips to archeological digs, and on Friday afternoons he worked in the garden on campus. He became Grandpa Ray to all of us, and his kindness, resilience, and optimism are inspiring. From the Hollister Ranch to the world and the cosmos, Lincoln Hollister's life has been one of discovery and exploration. In this interview he speaks enthusiastically about his work as a geologist and reminisces with love and insight about his roots. In this 1998 visit with the students of Vista de las Cruces, Cresensio Lopez spoke proudly of his Chumash heritage, which he believed was best expressed with kindness and generosity toward people and respect for the land. "We don't live alone on this earth," he told us. "We share." A beloved musician, singer, and songwriter also respected for his activism and philanthropy, Jackson Browne sat down for an informal conversation with our students on a rainy day in 2002. The result is one of the most authentic, revealing, and touching interviews he has ever done. Born on a farm in Colorado in 1913, Evelyn Mason moved to California with her husband in 1941 to work at Douglas Aircraft. "I was Rosie the Riveter," she told us. She made her contribution to the war effort, happy to be of service, then humbly stepped aside when the soldiers returned. "Some boy could have my job." "I've tried to be a cowboy," Jake Copass told us, "and I've tried to be a good one." A wrangler for many years at the Alisal Guest Ranch in Solvang, he also made quite a name for himself as a cowboy poet. Our Dunn Middle School students interviewed Jake in the year 2000. He had the grace and integrity of a man doing the work he felt was right for him. A therapist, writer, and pilgrim of sorts, Doyle Hollister reflects in this interview on his deep connection to the land that is the Hollister Ranch, the lessons he has learned in his personal journey, and the need we all have for wilderness in our lives. Bill Reynolds is a man who has reinvented himself many times, but through all of his endeavors there runs a creative spirit, a sense of authenticity, and a profound appreciation for the iconic cowboy culture and heritage of the American West. Property and maintenance chief at the Hollister Ranch and a congenial presence around here for nearly forty years, Scott McIntyre sat down with us a few weeks before retiring and shared his reminiscences and thoughts about tending the land, the changes he's seen and the things that make him hopeful, and the unceasing wonder of being here.